Florida’s Hukilau just wrapped and tiki events are in full swing for the summer. Here’s a heads-up on some of the festivities coming up — admittedly with a Southern California bias. “The Biggest Little Event in Tiki” takes place at The Tiki Resort in Lake George, NY, a Polynesian-themed motor inn from the 1950s. The gorgeous Egyptian Theatre in Hollywood will screen the excellent documentary “Plastic Paradise: A Swingin’ Trip Through America’s Polynesian Obsession” along with some bonus tiki film clips. 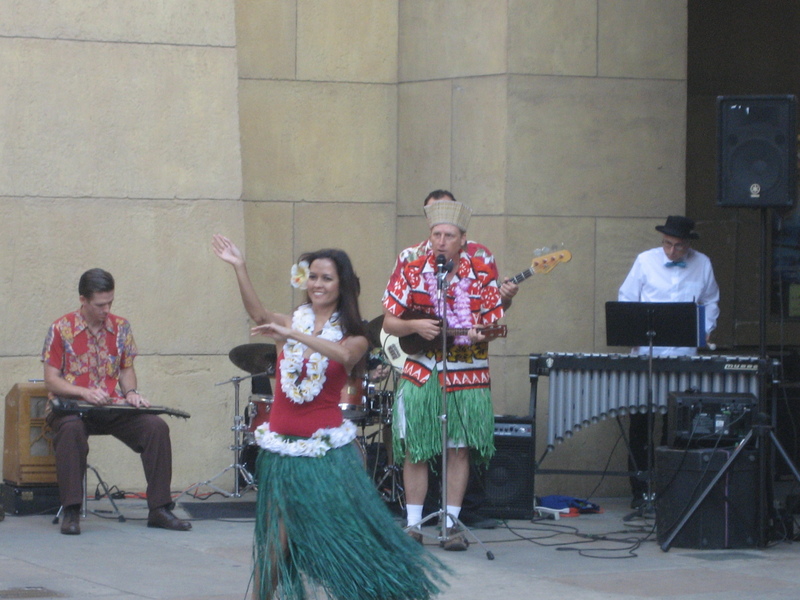 There will also be performances from King Kukulele & The Friki Tikis and the Polynesian Paradise Dancers in the courtyard. 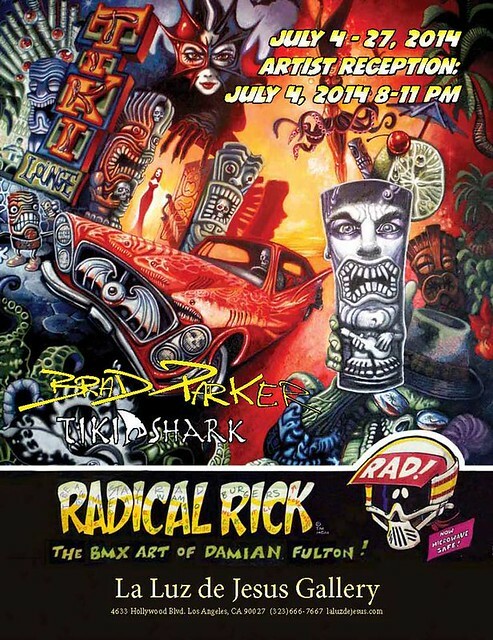 Brad “Tiki Shark” Parker‘s tiki-influenced “low brow art” will once again grace the walls of La Luz de Jesus gallery in Los Angeles from July 4-27. The Insect Surfers will rock the opening reception on Independence Day. Also: There will be rum. Portland’s Tiki Kon features a line-up of surf and lounge bands, burlesque, tiki vendors, panel discussions (“Home Tiki Bar Basics”) and more. The International Tiki Marketplace at Don the Beachcomber is your bi-monthly opportunity to go on a serious tiki shopping spree — I know from experience. Dozens of vendors offer tiki mugs, carved tikis, art, jewelry, etc. San Diego’s Tiki Oasis has a beatnik flavor for this 14th installment. The epic weekend features tons of bands, symposiums, burlesque, a vintage car show and much more. 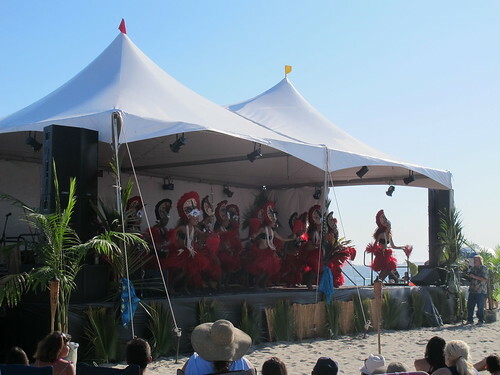 It’s no competition for Tiki Oasis, but Long Beach’s Tiki Beach Festival has its charms, among them Polynesian dancing, Hawaiian food and canoe rides. 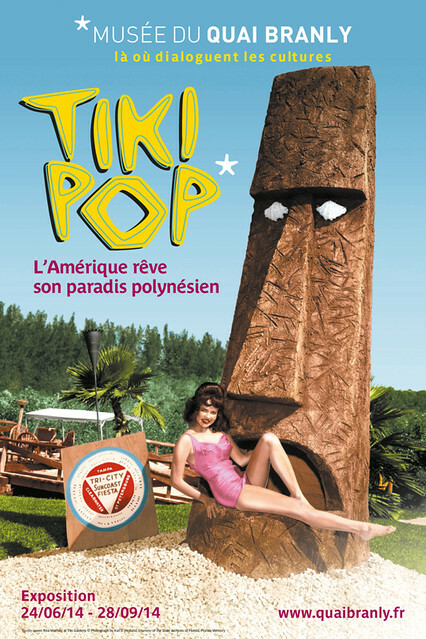 The Book of Tiki author Sven Kirsten‘s special exhibit “Tiki Pop: America Imagines its own Polynesian Paradise” is now on display at the Musée du quai Branly in Paris. The accompanying book is available for pre-order and will be released on August 1. Check out the Events Calendar section on Tiki Central for even more postings. I also tend to post about upcoming tiki events on Facebook and Twitter. Yes! I saw that one last night and promptly forgot about it. Mahalo, Lori!